For the second day in a row, a Hawaii football starter spent practice time watching from the side with an injury. Fortunately for UH, linebacker Blaze Soares' ailment is similar to center John Estes' in severity ... not very -- at least according to the two players afflicted. If it were game day, both said they'd play. Estes came back earlier than expected from a sprained elbow suffered Tuesday to participate in some drills. But as a precaution, he avoided contact. Second-year freshman Joey Lipp took a lot of reps at center, while Aaron Kia played left guard in place of Hercules Satele, who had a summer school test. If Soares' subluxed shoulder is a problem, the sophomore strongside 'backer didn't let on. "Every year I get this. It's nothing, whatevers. The trainers will decide (when he returns). But I can be back tomorrow," Soares said. "I had this all through high school." He said he re-injured the shoulder yesterday during 9-on-7 drills. 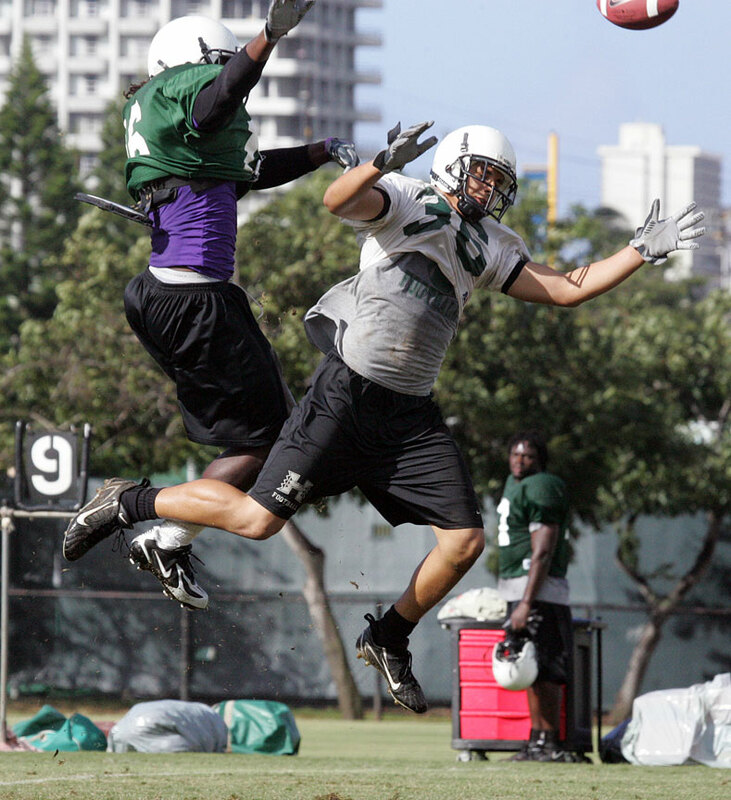 Senior Brad Kalilimoku filled Soares' spot. Linebackers coach Cal Lee said another player's helmet knocked Soares' shoulder out of place. "He had it last spring, too," Lee said. "It's one of those things. I'm going to work on getting him a larger set of shoulder pads. But he likes the small ones, for speed." Soares had been one of the stars of fall camp's early going, using his speed and hard hitting to disrupt offensive plays regularly during no-tackle scrimmages. Lipp played some center last spring, but was surprised to get so much action yesterday with Aaron Kia and Lafu Tuioti-Mariner available. "Today was kind of a surprise. I felt like I made some good calls, but there's still a lot to learn," said Lipp, who was still wearing a scout-team jersey. "One or two snaps early-on were high, but (No. 2 quarterback Tyler) Graunke helped me fix it." Another 3-hour practice was scheduled to start today at 8:30 a.m.